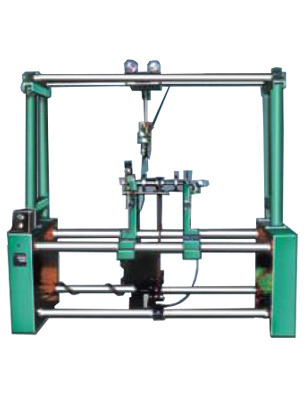 Machines model HDCM are belt driven horizontal type photo scanning Universal Hard Bearing Balancing Machine, provided with microprocessor based measuring panel HDCM – 8500 suitable for balancing different shapes of rotors, of electrical machines, Cylinders, fly wheel, rotor of centrifugal pumps and other type of rotating machines. 1) Cost saving on manufacturing of precision adaptor to connect drive coupling to rotor. 2) Any rotor can be balanced without losing time in manufacturing of adaptor. 3) The balancing accuracy of rotor not disturbed due to unbalance in drive coupling / adaptor. Amount and angle for unbalance for both planes displayed on separate DPMs. Hence linear accuracy is very goos as compared to analog meter + digit for amount and + degree for angle. Data of rotor dimensions and balancing tolerance i.e. values of A, B, C, R1, R2, t11, t12 are fed by key operation. Hence accuracy of data feedings accurate up to 1 digit. Data is provided with 'Self check' mode which checks proper functioning of digital display. LED's is cycle operation. This helps immediate fault detection. Panel is provided with ‘self-check’ mode which checks proper functioning of digital displays, LEDs is cyclic operation (optional). This helps immediate fault detection. ‘FIE’ software specially developed with 3-99 component indication, is suitable for balancing of rotor with fixed locations for balancing correction. Separate drilling attachment 19mm. Capacity with a vertical drilling head , manual. Portable type reveting hammer (piston type) speed 1800 blows/minute, capacity 6mm in a aluminum suspected from top with rail. The balancing speed depends upon selection of the rotor diameter, where drive is to be given and the motor pulley diameter. 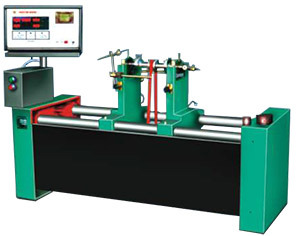 All the machines above operate on mains supply of 400 to 440 V, 3Ø, 50 cycles. Due to constant R & D, specifications and features are subject to change without notice. The dimensions given above are approximate.